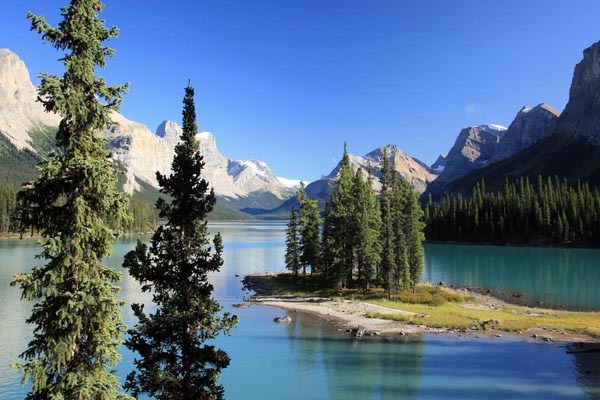 Jasper National Park boat tours take place on Maligne Lake, a 40-minute drive south of the town of Jasper. In 1908, Mary Schäffer and her guides fashioned a raft from trees and paddled onto Maligne Lake. Today, visitors can enjoy the same lake-and-mountain panorama enjoyed by Schäffer over a century ago from the comfort of a covered tour boat on a 90-minute scenic cruise to Spirit Island. The only company licensed to operate on the lake is Maligne Tours, which has been taking visitors out on the lake for over 80 years. The boat tour to Spirit Island is hosted by a tour guide who is well versed on the natural and human history of the lake, with the a commentary starting as the boat departs the dock at what is locally known as Home Bay. Passengers hear of ancient rockslides that spread across the valley, the geology of prominent peaks is explained, and an overview of local wildlife is given. As the boat continues toward Spirit Island, the origins of surrounding mountains become more obvious as the guide describes their composition and pint out features such as the Opal Hills and fault lines. As the boat motors southward, a number of glaciers come into view, and the geology of these frozen rivers of ice clinging to the mountains is explained. The scenic cruise runs multiple times daily between early June and early October, weather permitting. For the best chance of enjoying calm water and less crowds, plan to join an early morning or late afternoon cruise. Make reservations in advance either at Maligne Tours downtown ticket office at 616 Patricia Street (780 852 3370 or 866 625 4463), or out at the lake, or book online at www.malignelake.com.